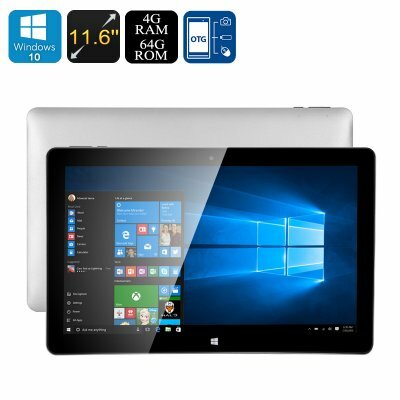 Successfully Added Jumper EZpad 6 Tablet PC - Licensed Windows 10, 4GB RAM, Intel Cherry Trail CPU, 11.6-Inch Screen, OTG to your Shopping Cart. The Jumper EZpad 6 is a beautiful and sleek 2 in 1 tablet PC that can be attached to an external keyboard base (not included). By allowing you to connect the display to a keyboard, you can personally choose whether you’d like to use this remarkable device as a tablet PC or a traditional laptop. Thanks to its ultra-sleek and lightweight design the Jumper EZpad 6 is extremely portable – allowing you to simply slide it in your bag and carry it along wherever you go. Along with the latest hardware and software, this Windows 10 tablet PC is capable of smoothly handling mobile entertainment and business alike, making it a great device for students, business people, and anybody else out there who’s simply looking for a compact tablet on which to enjoy countless hours of mobile fun and entertainment. Featuring the Intel Cherry Trail Z8350 processor, this sleek Windows 10 tablet computer is able to handle anything you throw it at. Build for speed and efficiency, this Quad-Core CPU that has been clocked at 1.44G is capable of reaching burst rates up to 1.92GHz, providing you with a powerful and energy efficient device that only uses its true power when needed. By doing so, this tablet PC allows you to take the most out of your battery life. The latter is, however, not something to worry about as the Jumper EZpad 6 packs an epic 7000mAh battery that provides up to 5 hours of continuous usage time – enough to watch a Full-HD movie from beginning to end, enjoy a day filled with online games, or simply browse the web for hours in a row without ever needing to worry about running out of juice. Besides its powerful Quad-Core CPU, this Windows 10 tablet also features the Intel HD Graphics 400 GPU that supports the usage of graphically intensive games and videos. On its stunning 11.6-Inch FHD IPS touchscreen display, this two in one Tablet PC allows you to enjoy all your favorite media and games in absolutely stunning 1080p resolution – providing you with mesmerizing detail and vivid color. Supporting up to 64GB of internal memory you can be assured that this sleek Windows 10 tablet packs enough storage to save all your games, media, and files alike. With the Jumper EZpad 6 at your side, you’ll be able to enjoy countless hours of entertainment in breathtaking beauty – assuring that you’ll never have to be bored again. Running on a Windows 10 operating system, this Chinese tablet PC comes packed with all the features and programs Windows users are familiar with - ensuring a smooth and powerful user experience. The Jumper EZpad 6 allows you to enjoy great connectivity via its Wi-Fi and Bluetooth support. Added to that, its numerous ports such as OTG, HDMI, and USB allow you to connect this Windows tablet computer to plenty of peripherals. Whether you like to use it as a laptop or tablet PC, this powerful device is sure to meet your demands and is perfect for business and entertainment purposes alike. The Jumper EZpad 6 comes with a 12 months warranty, brought to you by the leader in electronic devices as well as wholesale electronic gadgets..